The Tuliptree grows to have one of the widest trunks and be one of the tallest trees in the East. Tuliptrees (Liriodendron tulipifera) have numerous common names and are among the most common trees in our region. These names include Tulip Poplar, Yellow Poplar, White Poplar, Whitewood, Canoewood, Fiddle-tree, and Saddle-leaf Tree. Although the leaves do tremble and shake like true poplars and they have light colored wood, they are actually in the more primitive magnolia family, and the term "poplar" is often frowned upon by botanists. Their scientific name translates to "lily tree bearing tulips" and refers to the flower shape and to the leaves which look like a tulip in profile. Tuliptrees are extremely fast growing and are often considered to be the tallest deciduous trees in the East, potentially getting over 180' tall. They also have very wide trunks (30' +), perhaps the 3rd widest in the East after Bald Cypress and American Sycamores. I have a (fairly poor quality) picture of my family standing in front of a particularly large Tuliptree in the Smokies with room to spare on the sides. Tuliptree flowers are not easily seen because they are so high in the canopy until they start dropping. The flowers are large and fairly showy, but are rarely seen until they have fallen from their lofty perches. They are a mix of yellow, orange, and and green. Some people float them decoratively in water bowls. Although mostly scentless, thebloomsy are extremely rich in nectar. This makes them a favorite of several pollinators such as bees. Tuliptree honey is considered a favorite (at least for baking) and, in some areas, 30% of the forage for honeybees is made up of this tree. Tuliptree flowers are very rich in nectar and favorite of several animals with sweet tooths. I enjoy a sweet sip of nectar from one of the few low growing flowers I could reach. I mentioned how fast growing Tuliptrees are. This makes for relatively soft wood, but it does have some very appealing properties. For one, it does not absorb steam very well, making it a favorite for hat blocks. Because the Native American Indians in our region did not have metal tools, this tree was very valuable for making dugout canoes (and giving it one of its names of Canoewood). It could be worked with stone tools and strategic burning. Moreover, it grew very straight, tall and wide. Captain John Smith reported seeing some capable of carrying 40 warriors at a time. Lore has it that Daniel Boone led a group in a 60' dugout holding 35 people. Canoewood trunks can be wide, tall, and very straight. The tree also tends to "self prune" dropping its lower branches in shady situations. This made for less branches to cut off. The wood also does not split very easily. All good traits for a dugout canoe, even if the wood was not especially durable against rot. Lower branches often "self-prune" in the shade leaving distinctive scars where they grew. Tuliptree has been used by people for many more applications however. The Cherokee used it to treat pinworm, dysentery, rheumatism, boils, fever, and coughing. During the Civil War, Dr. Francis Porcher was tasked with finding alternative uses for plants in the embargoed South. His treatise listed numerous uses for this particular tree. He considered it one of the best substitutes for "Peruvian bark" (Cinchona used for quinine) to treat malaria for instance. He suggested that its seeds could be used as a laxative and to treat dysentery. The leaves he reported could be applied to the forehead to relieve headaches. Francis Porcher also recorded that a respected Doctor Young wrote in a letter about Tuliptree usefulness to Arkansas Governor Powell Clayton, claiming: "He has never known it to fail in a single case of worms." In Virginia, Tuliptree bark was mixed with Flowering Dogwood and Black Alder in horses troughs to treat them for bot flies. During Fall, the leaves turn a brilliant yellow color. In winter, the seed heads are quite distinctive and long lasting. They look like candelabras up high in the canopy. This along with their tall straight trunks, with noticeable branch scars for where they dropped their lower branches, make the trees fairly easy to recognize. A Tuliptree seed head consists of seeds (samaras) arranged around a central spike and shedding from the inside out. The seed heads consist of the seeds arranged around a central spike. They drop starting from the inside out, but can endure the whole winter. The seeds are a type of "samara" similar in function to the maple "helicopters" many people are familiar with. They can float for quite a distance with any breeze. This makes them particularly good pioneer tree species, sometimes dominating in forming wood lots, especially since they are not a favorite of too many animals as a food source, can remain viable for 4-7 years, and are produced in large numbers. A Tuliptree seed (samara) separated from the rest after helicoptering away from parent plant. Tuliptrees are not favored as deer browse, though they will eat them. Having broken off stems and smelled them, they do appear to have a fairly distinctive odor, though I wouldn't call it a bad smell. It seems like deer and other browsers don't care for them, at first anyways. This allows them a competitive edge over such forest staples as oaks in establishing themselves. Since they also can grow so quickly, they can dominate young woods, but are generally not tolerant of shade. They can live up to 500 years. Saplings grow very quickly as pioneer species after being spread by the wind, and are not a favorite browse of deer. Although not a favorite for mammalian browsers, at least 21 caterpillar species use it as a host plant to feed on. This includes our largest Geometrid (inchworm) moth, the Tuliptree Beauty. The hanging candelabras of seed heads, tall straight trunks, and branch scars make the older trees rather easy to pick out in a winter woods, but the buds are also distinctive. They are said to look like duck bills. The "duck bill" end buds of Tuliptrees are distinctive. Though common, these are beautiful native trees with unique features, well deserving of being the state trees of Indiana, Kentucky and Tennessee. Regardless of season, they are fairly easy to distinguish from other trees. As one last thing to mention, the trees may be well known for their tulip-like shape, but they make nice cat masks during the Fall for kids. For those of you who work with kids, this is my favorite way to end a field trip during the Halloween season. I find a location at the end of the walk with lots of Tuliptree leaves (I often place a bunch of nice ones there to use). I tell the group that I would like to show them the costume I intend to wear. Choosing the large shade leaves (the lower and larger leaves that young trees sometimes produce to capture the diminished sunlight filtering through the canopy), fold one in half, poke holes, and you have a cat mask. Everyone thus can take a memoir of their visit (and of the Tuliptree) home. Although tulip-shaped, the shade leaves make great cat masks! A large male American Bullfrog floats, calling in a pond. Note that the dorsolateral skin fold goes around the eardrum (tympanum) rather than going down the back. A male Green Frog floats on a pond. Note that the dorsolateral fold of skin goes part way down the back. Unlike other North American frogs where the female, in order to be able to carry more eggs, is larger than the male, just the opposite is true of Bull Frogs. The males are bigger due to having territorial disputes where the larger males force or bully the smaller ones away. The larger males have thus been selected for and have greater mating success. Males are quite easy to tell from females once they are adults. Not only are they bigger and have a yellowish throat during the breeding season, but their tympanum (ear drum) is larger than their eye. Female have eyes that are about the same size as their tympanums. These are all sexual differences their smaller Green Frog cousins also have. The larger male Bullfrog with its eardrum (tympanum) larger than its eye courts the smaller female who's tympanum is about the same size as the eye. Also unusual in frogs, the females will sometimes also call, though this is normally the scream both sexes may give if they are caught by a predator. Some suspect that this release call attracts an even larger predator that might break up the attack and allow the frog to escape in the scuffle. Indeed, I've several times heard the screaming and gone to investigate, interrupting a feeding snake in the process. In most species of frog or toads, only the males vocalize. A Bull Frog tadpole already developing its back legs. Once a female has chosen her suitor, she will lay a large floating mass of eggs numbering between 3,000-50,000 eggs. In less than 3 weeks, the tadpoles emerge. These tadpoles take 2 and sometimes 3 (up North) years to metamorphose into an adult. This again differs from most of our frogs which change over in a single growing season. The olive colored tadpoles can also grow to be our biggest. Some polliwogs can be up to 6" long. Although they typically eat algae or detritus just like other polliwogs, they are also unusual once again in occasionally scavenging meat and eating other tadpoles. They are distasteful to some fish as well which allows them to live in permanent ponds with them. Bull Frog tadpoles are the largest in North America and take the longest to develop (2-3 years) of all our native tadpoles. 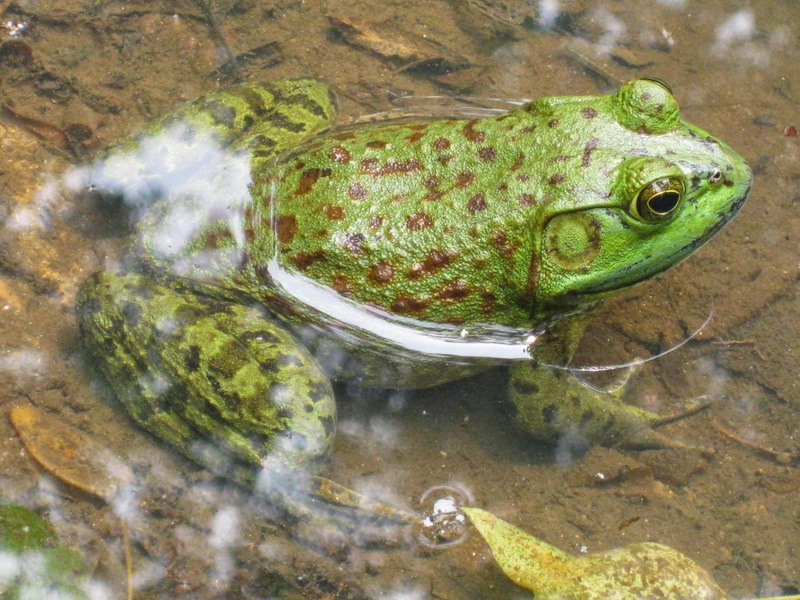 Bull frogs are notorious for eating anything smaller than themselves, including each other. I've seen them eat small mice, frogs, and even small snakes. I once was leading a group of kids and watching a Red-winged Blackbird land next to the water, when a large Bull Frog grabbed it. They struggled for a while before the ruffled bird got away. This voracious trait has resulted in some local extinctions of animals. These are the most commercially available frog tadpoles because they take so long to change over and can be kept with small fish in aquarium pet stores. For this reason, they are the ones most bought for release into home ponds. Bull Frogs will eat any smaller species there however. They have been outlawed for sale in some countries like England where they have become an invasive predator of small ponds. They have even been implicated in the demise of California's Red-legged Frog. Bull Frogs from Maryland were taken to California for their edible legs and for frog jumping contests like that at the famous Calaveras Fair. Now they pose a threat to the smaller Red-legged Frogs who were already in trouble due to habitat destruction. It is important to realize that being native does not mean they belong everywhere, as that can upset the natural balance. Bull Frogs, if they survive being eaten by each other, snakes, humans, or the numerous other creatures who consume them, can live 15 or so years. It takes a male 1-2 years to reach sexual maturity (2-3 for a female). Their Latin name was given to them in honor of the great American naturalist Mark Catesby. I truly appreciate these large frogs and their calls. Many times I've put aside my fishing rod or stopped what I was doing to try and sneak up on them and see what they were doing. I've been rewarded by many observations of them eating or being eaten. Luckily, these are tough amphibians who can survive in less than ideal conditions including farm ponds and park lakes. But they do not belong in every body of water because of their great size and appetites. Now that you know a bit more about them, you hopefully can appreciate them more as well.